The roles and responsibilities of a Hardware Technician is similar to that of a hardware specialist or computer technician and typically involves the following – installation and upholding IT systems and hardware systems, detecting key problems, reviewing and running hardware components and elements to detect errors, connecting programs and operational functionalities with hardware systems, maintaining and repairing technological equipment, performing regular check-up’s and upgrades, and troubleshooting issues. 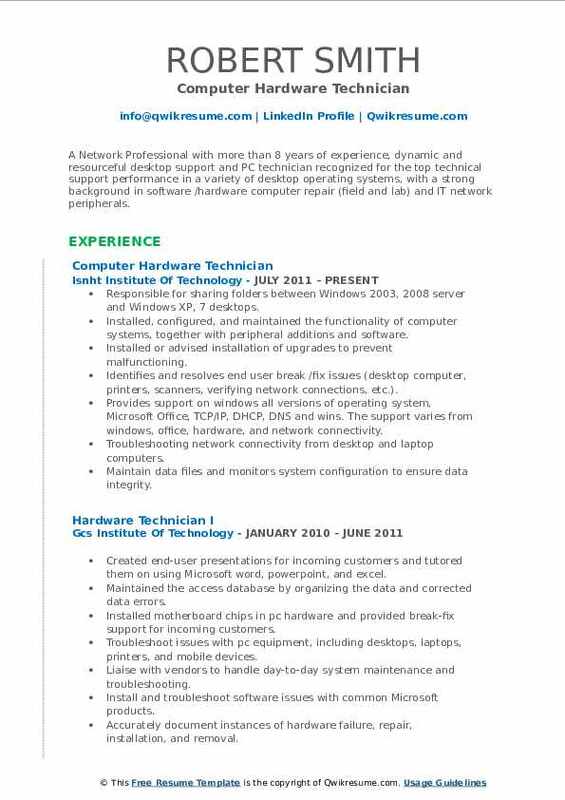 The hardware technician should have good knowledge of software and hardware skills and its fundamentals, they should be expert with repairing and connecting hardware systems, they should also be aware of WAN/LAN networks and possess good knowledge of IT components and computer systems. 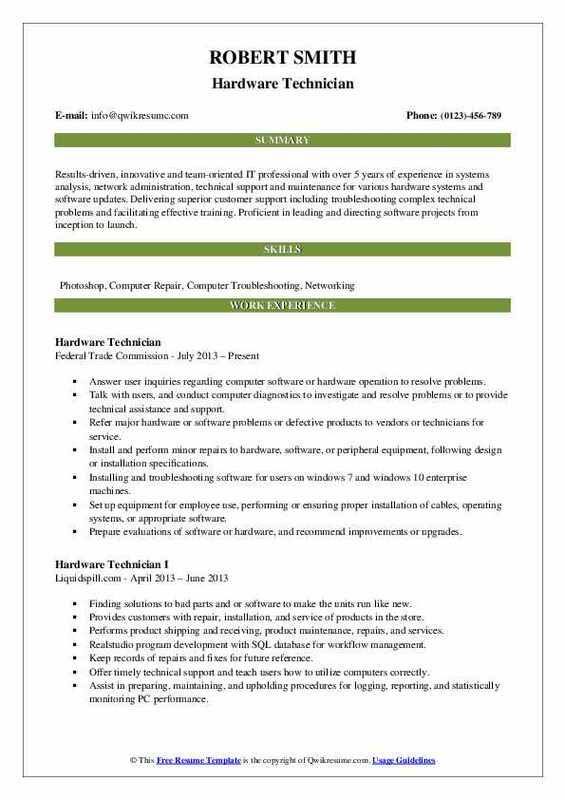 A college degree in the field of computer science with majors in areas like hardware and networking should be mentioned on the Hardware Technician Resume. Summary : Dedicated technician and an individual contributor, able to operate complex systems in all types of environments and conditions and accomplish organizational goals with accountability and confidence, has more than 22 years of experience. Skilled at identifying and diagnosing problems, following detailed procedures in technical manuals and publications, performing minor maintenance and repairs, and determining the need for specialized repair services. Troubleshoot, test, adjust and inspect all communications and timing equipment in tech control and communication center to ensure they meet the range requirements. Install, operate and perform unit level maintenance on manual and automated. Ensure preventive monthly inspections (PMIS) are completed and entered into the integrated maintenance data system (IMDS). Coordinate between local users and the corresponding "distant end" resolving circuit dilemmas. Maintain logs for test, measurement and diagnostic equipment (TMDE) and ensure calibration is completed before the overdue date. Monitor, troubleshoot and maintain secret internet protocol router network (SIPRNET) terminals. Create, process and distribute classified documents in accordance with established procedures and guidelines. Ensure monthly facility manager checks are completed and the folder is up to date. Created controlled area program for the assigned section and provide needed training to personnel. Summary : Driven Hardware professional with more than 17 years experience, a broad background in system testing & system configuration on lab networks requiring a thorough understanding of hardware & software fundamentals. Proven track record of troubleshooting & performing design verification testing on individual circuit boards & completed system on both signal & power circuits. Tested electrical system and boards with a standard lab test and measurement equipment, including modern digital oscilloscope, TDR, impedance measurement, led luminosity meter, vector network analyzer, electrical load, signal function generator, data logger, and DMM. Performed system bring-up, DVT (design verification test), debug / troubleshooting, failure analysis, and bench DVT test for power rails and i2c, maintaining quick turnaround, catching identified bugs, and assisting the engineer in choosing design out of specification. Conducted system testing for qualification parts at different corners parameter in chamber, enabling engineer ability to use parts with reduced risk. Supported failure analysis activities for development, sustaining, and field returned products, providing information for customer reports regarding root-cause and corrective action. Performed the print circuit board (PCB), solder reworked through changing component such as a small resistor, capacitor, and IC, after root-cause on PCB was identified. Received recognition from engineer and customers for supporting completion of DVT on-time for product release from RD lab on 3 product families. Built-up system, and maintained virtual network computer (VNC), enabling the lab to share with multiple users at once on any sessions. Set up a new scope and new personal computer for lab usage, standardizing all equipment to comply with anti-virus software, and accessibility on the network with VNC enable. Created profile for thermal chamber to cycle at different temperatures and duration, driving efficiency, and saving time and manpower. Headline : Results-driven, innovative and team-oriented IT professional with over 5 years of experience in systems analysis, network administration, technical support and maintenance for various hardware systems and software updates. Delivering superior customer support including troubleshooting complex technical problems and facilitating effective training. Proficient in leading and directing software projects from inception to launch. Talk with users, and conduct computer diagnostics to investigate and resolve problems or to provide technical assistance and support. Installing and troubleshooting software for users on windows 7 and windows 10 enterprise machines. Maintain records of daily problems and actions taken, or installation activities. Inspect equipment and read order sheets to prepare for deployment to users. Summary : A Network Professional with more than 8 years of experience, dynamic and resourceful desktop support and PC technician recognized for the top technical support performance in a variety of desktop operating systems, with a strong background in software /hardware computer repair (field and lab) and IT network peripherals. Responsible for sharing folders between Windows 2003, 2008 server and Windows XP, 7 desktops. Installed, configured, and maintained the functionality of computer systems, together with peripheral additions and software. Installed or advised installation of upgrades to prevent malfunctioning. Identifies and resolves end user break /fix issues (desktop computer, printers, scanners, verifying network connections, etc.). Provides support on windows all versions of operating system, Microsoft Office, TCP/IP, DHCP, DNS and wins. The support varies from windows, office, hardware, and network connectivity. Troubleshooting network connectivity from desktop and laptop computers. Maintain data files and monitors system configuration to ensure data integrity. Diagnosed units to be repaired or scrapped and assembled scrap pallets for recycling. Assembled, repaired and built hardware on computers units and other electronic items. 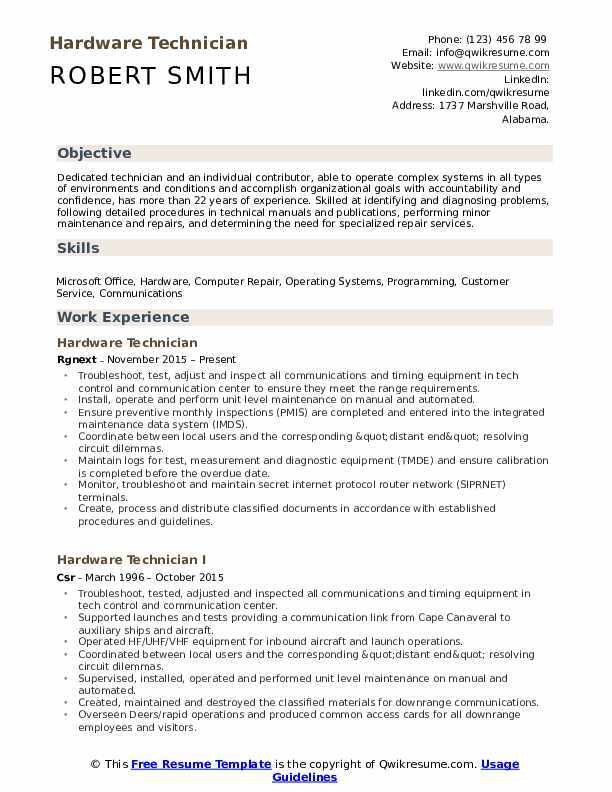 Summary : Hardware Electronics Technician with over 14 years experience in the technology field from field return repairs to lead technician on complex engineering prototypes.Responsible for Lab PC setup to include OS install and set-up, all major software installation (Mentor, Quartus, Power-One DPM GUI, and Agile) and maintenance of hardware and software. Support all on-site engineers including mechanical, electrical and software to include system test, repair, debug and troubleshooting of all f5 hardware for the last 10years. Worked hand-in-hand with engineers on tuning, testing, and verification of PCI, PCIe, i2c, SATA, SAS. Compliance and verification testing of hardware and components including signal integrity, shock vibe. Tested and help resolve HDD performance issues that were caused by system and power supply fan vibration on the 6900 and 8900. Usage of test and repair equipment (DMM, high-speed oscilloscopes, solder and de-soldering under microscopes). Ability to read, analyze, and interpret internal specification documents and schematics. Lead technician on the discovery project (i10000, i7000, i5000), the largest prototype build in f5 history with over 300 total prototypes that were repaired, distributed and inventoried. Inspecting and testing computers, tablets, smartphones, game consoles, audio devices, and smartwatches to work properly. Installed network and computer systems, such as home network, local server, routers and switches configurations, and customized. 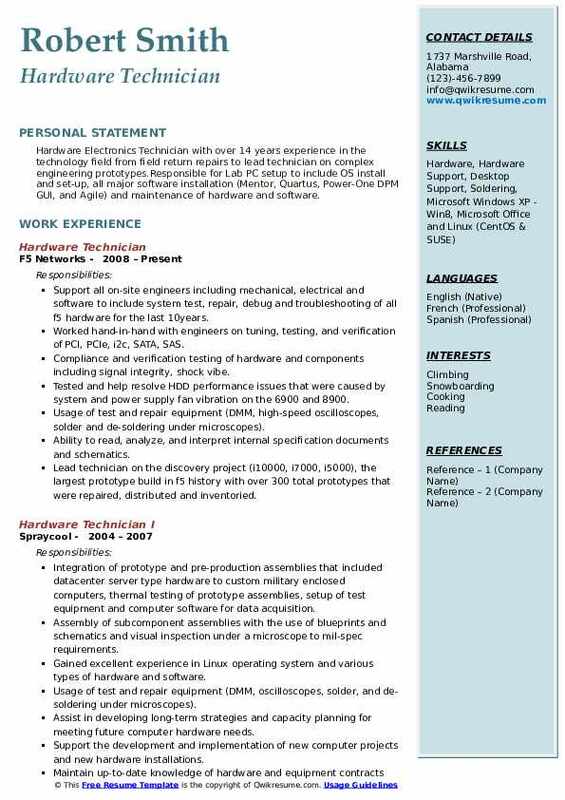 Objective : Looking for a job to challenge me while expanding my skillset and knowledge of engineering and manufacturing. 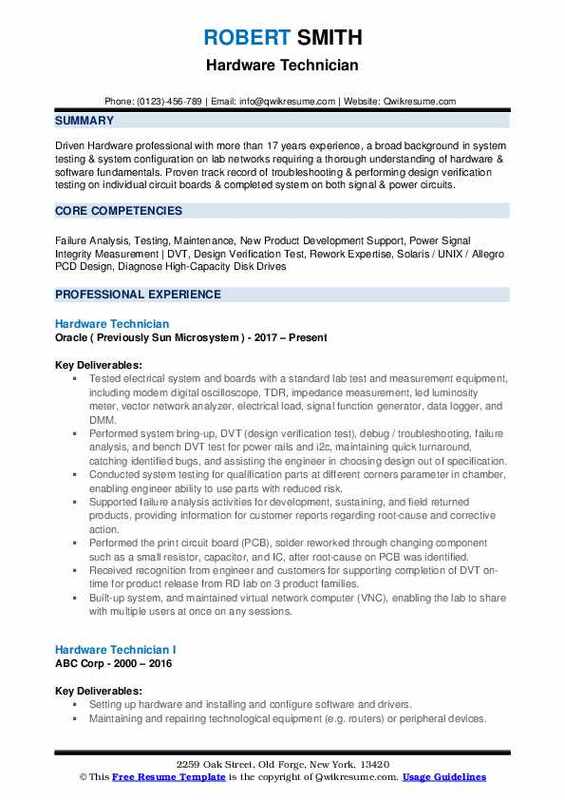 Has experience of more than 4 years, want to contribute to a hardworking team while getting valuable experience to prepare me for the career. Answer user inquiries regarding computer software or hardware operation to resolve. Enter commands and observe system functioning to verify correct operations and detect. Set up equipment for employee use, performing or ensuring proper installation of cables. Install and perform repairs to hardware, software, or peripheral equipment, following. Maintain records of daily data communication transactions, problems and remedial. Read technical manuals, confer with users, or conduct computer diagnostics too. Investigate and resolve problems or to provide technical assistance and support. Cleaned, tested and troubleshoot units needed for daily production goals. Responsible for diagnosing, auditing and performing maintenance on electronic equipment. 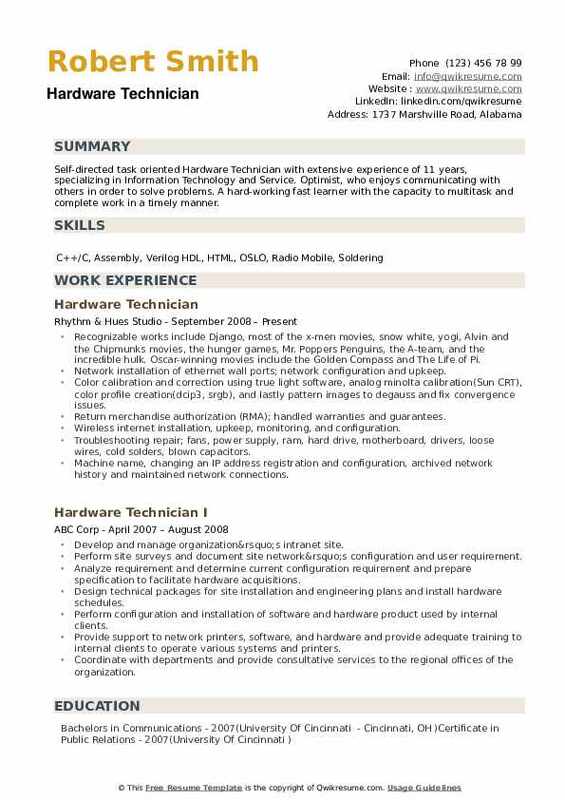 Summary : Experienced Hardware Support technician with over 16 years of computer hardware experience in the information technology industry, specifically focused on, customer support, board level repairs, and building servers and desktops. Assisted with expanding inventory by introducing new equipment to help generate sales with IBM servers and desktops, along with Cisco, HP and Dell switches and routers. A self-motivated individual is driven to learn more about new industrial equipment and advancements. Built, configured, troubleshot servers and desktops along. Responsibilities include building servers to customer expectations and running diagnostics to ensure equipment is fully functional. Testing equipment before receiving new inventory to ensure the product is 100% functional. Set up equipment for new employees, including installing cables and hardware. 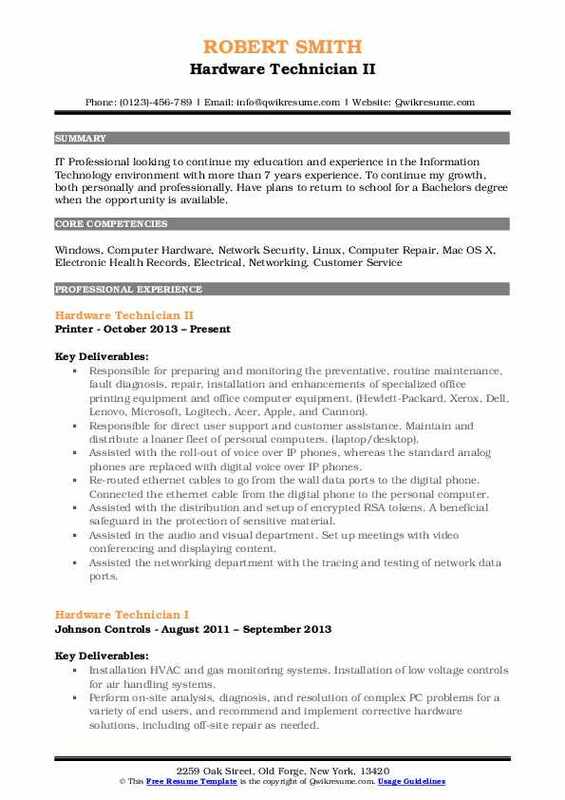 Assisted with introducing IBM products and taking on the role of lead IBM technician. Expanded networking equipment inventory by researching and learning new product lines, such as Dell and HP switches. Created bootable media devices to update the firmware to the latest firmware levels along with a diagnostics. Directly worked with customers in troubleshooting equipment and resolving error codes. Trained other technicians with the building, updating firmware and troubleshooting. Assisted with inventory control and management by cycle counting and organizing inventory to help increase productivity. Set up and configured hardware and software on company equipment. Restored data, operating systems, files, documents, and drivers. 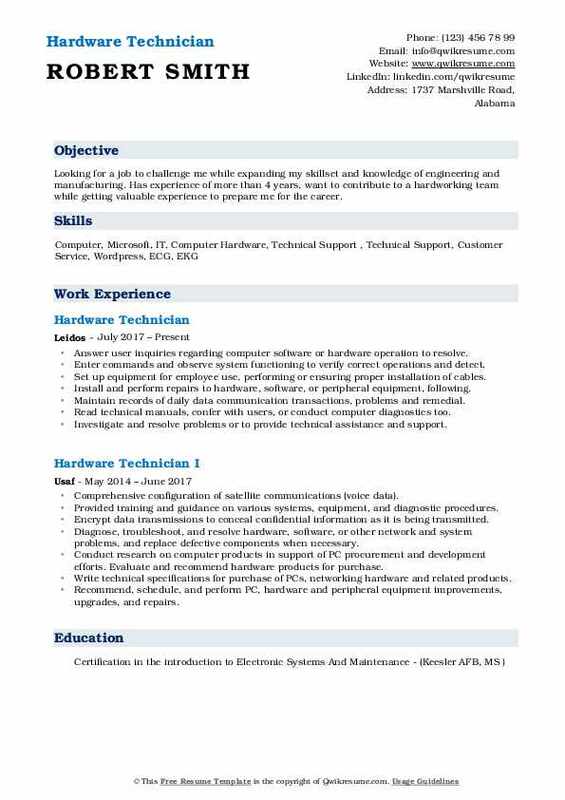 Summary : IT Professional looking to continue my education and experience in the Information Technology environment with more than 7 years experience. To continue my growth, both personally and professionally. Have plans to return to school for a Bachelors degree when the opportunity is available. Responsible for preparing and monitoring the preventative, routine maintenance, fault diagnosis, repair, installation and enhancements of specialized office printing equipment and office computer equipment. (Hewlett-Packard, Xerox, Dell, Lenovo, Microsoft, Logitech, Acer, Apple, and Cannon). Responsible for direct user support and customer assistance. Maintain and distribute a loaner fleet of personal computers. (laptop/desktop). Assisted with the roll-out of voice over IP phones, whereas the standard analog phones are replaced with digital voice over IP phones. Re-routed ethernet cables to go from the wall data ports to the digital phone. Connected the ethernet cable from the digital phone to the personal computer. Assisted with the distribution and setup of encrypted RSA tokens. A beneficial safeguard in the protection of sensitive material. Assisted in the audio and visual department. Set up meetings with video conferencing and displaying content. Assisted the networking department with the tracing and testing of network data ports. Some experience with active directory. (making sure users computers were in the right location). Assisted user support with the adding and removing of programs and software. 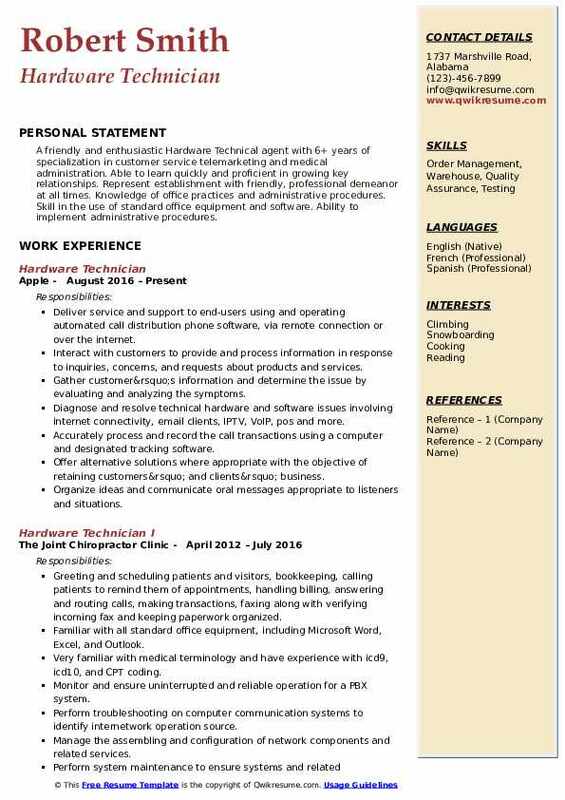 Headline : A friendly and enthusiastic Hardware Technical agent with 6+ years of specialization in customer service telemarketing and medical administration. Able to learn quickly and proficient in growing key relationships. Represent establishment with friendly, professional demeanor at all times. Knowledge of office practices and administrative procedures. Skill in the use of standard office equipment and software. Ability to implement administrative procedures. Diagnose and resolve technical hardware and software issues involving internet connectivity, email clients, IPTV, VoIP, pos and more. Accurately process and record the call transactions using a computer and designated tracking software. Offer alternative solutions where appropriate with the objective of retaining customers’ and clients’ business. 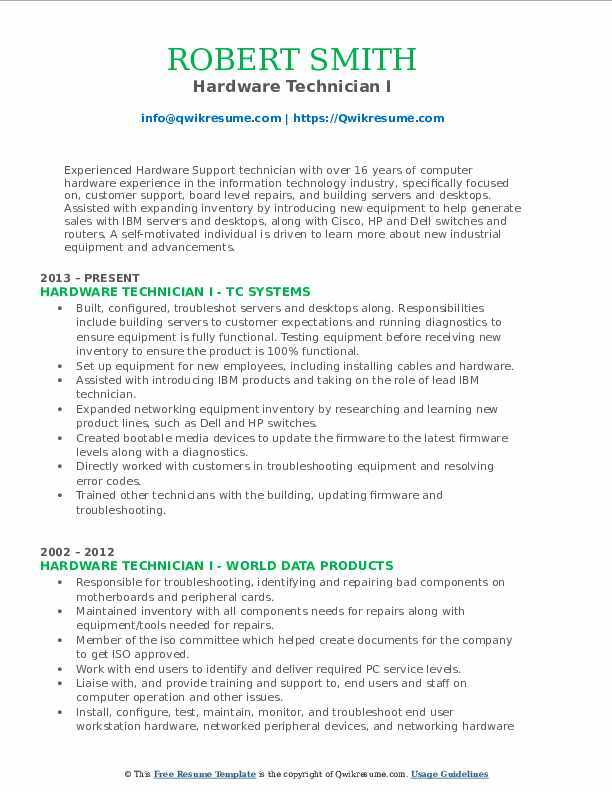 Summary : Self-directed task oriented Hardware Technician with extensive experience of 11 years, specializing in Information Technology and Service. Optimist, who enjoys communicating with others in order to solve problems. A hard-working fast learner with the capacity to multitask and complete work in a timely manner. Recognizable works include Django, most of the x-men movies, snow white, yogi, Alvin and the Chipmunks' movies, the hunger games, Mr. Popper's Penguins, the A-team, and the incredible hulk. Oscar-winning movies include the Golden Compass and The Life of Pi. Network installation of ethernet wall ports; network configuration and upkeep. Color calibration and correction using true light software, analog minolta calibration(Sun CRT), color profile creation(dcip3, srgb), and lastly pattern images to degauss and fix convergence issues. Return merchandise authorization (RMA); handled warranties and guarantees. Wireless internet installation, upkeep, monitoring, and configuration. Troubleshooting repair; fans, power supply, ram, hard drive, motherboard, drivers, loose wires, cold solders, blown capacitors. Machine name, changing an IP address registration and configuration, archived network history and maintained network connections. Managed the conference room checks, and reporting to management usage metrics. Conference room support and set up for presentations and video conferences.